The brilliant, tragic career of Charles Rennie Mackintosh has been so mytho-logised that it can be difficult to make a balanced appreciation of his achievement. An inventive architect and interior designer, he is perhaps best understood in the context of the international Art Nouveau or Jugendstil of the 1890s. Because his work was well received in Vienna and elsewhere on the Continent, it has encouraged the idea that he was more appreciated abroad than in his native city. In fact, Glasgow was probably the only place in Britain that could have encouraged his talent, but he was part of a wider school of progressive design that flourished there in about 1900. Mackintosh was born in Glasgow, the son of a police clerk and his first wife, Margaret Rennie. He was articled to local architect John Hutchison, and then, in 1889, joined the office of Honeyman & Keppie as a draughtsman. All the Glasgow buildings on which Mackintosh’s reputation are based were done when he was first an assistant and, after 1901, a partner in this leading practice. At the same time, between 1883 and 1894, Mackintosh attended the Glasgow School of Art. Here, he joined a group of talented students, mainly women, who called themselves The Immortals. Mackintosh’s talent as a creative manipulator of form, endowing traditional motifs with the recondite symbolism of Art Nouveau, first emerged in the building for the Glasgow Herald (1894-95) and then in his treatment of Gothic at the Queen’s Cross Church (1897-99), now the headquarters of the Charles Rennie Mackintosh Society. In 1896, Honeyman & Keppie won the competition for a new building for the Glasgow School of Art; the eventual result is now the best known of Mackintosh’s buildings. Original as the design was, however, there are clear influences from old Scottish castles and Elizabethan architecture, as well as from contemporaries, such as Norman Shaw, J. J. Burnet, Smith & Brewer and C. F. A. Voysey. These were reinterpreted with a unique sensibility. Mackintosh designed several houses near Glasgow, of which the best and most characteristically treated internally is Hill House at Helensburgh (1902-04). Externally, the wall surfaces are roughcast, giving the house an appearance that is somehow modern, but which also, in its abstraction, has the character of old Scottish castles. But perhaps his most accomplished buildings were urban, such as the Daily Record printing works (1901-04). By the time the Glasgow School of Art was completed, there was a reaction against the ‘Free Style’ of the 1890s in favour of a seemingly rational Beaux-Arts inspired Classicism. Mackintosh could not sympathise with nor follow this change in direction, and it must have been hurtful that a new generation of students now dismissed his work as ‘bizarre’. Honeyman, Keppie & Mackintosh now saw a decline in their output, and Mackintosh himself, increasingly prone to depression and heavy drinking, resigned his partnership shortly before the First World War. By 1915, he was in Chelsea with little prospect of work. His last significant job was for the Northampton engineer W. J. Bassett-Lowke, who much admired modern German design. 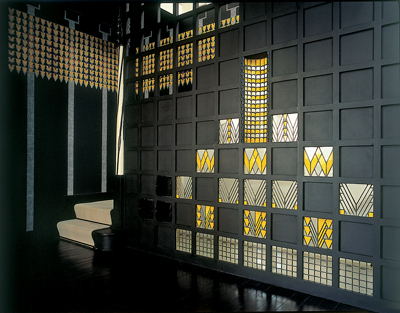 For him, Mackintosh remodelled the interior of 78, Derngate in a stylised, geometrical manner, which seems to anticipate Art Deco (1916-19). Mackintosh’s last years were spent in France, where he produced remarkable watercolour paintings that have the architectonic qualities of his built work. He died in London, largely forgotten, of cancer of the tongue. Margaret Macdonald died in 1933.